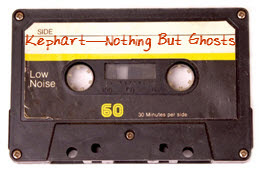 First of all, Ms. Kephart, congratulations on the release of NOTHING BUT GHOSTS, which already has received glowing reviews. You must be pretty pumped, what with your first novel coming out to such high praise. Um. Miss Lefler. Miss Lefler? It’s me. Beth. Beth Kephart. Over here. No. This way. This way. Yeah. Past the curtains. At the desk. That’s right. Ghosts is actually my tenth book, my third young adult novel. I mean, it might read like a first. Is that what you are suggesting? Perhaps you are borrowing another’s notes? I mean. It’s happened at the most prestigious journalistic institutions, not just with you. Okay, well…anyway. I read NOTHING BUT GHOSTS and, I must say, I loved it. That scene with the conga dancers – when they commandeer the Sparkletts truck and use it to squish those killer bees. WOW. I want what you’re drinking. With all due respect, I couldn’t have just made that up. No. Actually. You could have. I read your blog, remember? Okay, so how would you sum up the story, then? Well. It’s a story about surviving loss. About a rising high school senior whose mother has died. What lives on? she wonders. How will she? In searching for answers, she becomes embroiled in a mystery surrounding a strange recluse at a lush garden. It’s a mystery, a romance, a daughter-father story. Really? No killer bees? [mumbles] Then where the heck did I read that? All right, moving on… Can you tell us about the setting of the book? I see here that you were inspired by a special location in your town of Peoria. You probably didn’t read it. Perhaps you were watching TV? But, in any case, Peoria is a place I’ve always longed to go. Having not yet gotten there, however, I set the book in my hometown—the storied Main Line of Philadelphia—and in a world-renowned pleasure garden, known as Chanticleer. I wrote a memoir that took place in Chanticleer. I know this garden well, and am endlessly inspired by it. But let’s not talk inspiration. With you. How much do you pay your intern? I’m in the market. Your prose is so evocative and lush, Ms. Kephart – you have a remarkable gift for reinventing words and giving them a crisp newness. Let me ask you this: do you prefer using a hard copy of a thesaurus or do you rely more heavily on thesaurus.com? I used thesaurus.com up until a year or so ago. After that I just started making words up and hoping nobody noticed. 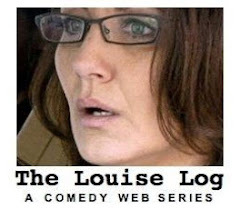 I try out all my invented words on my blog first. When the Blog Police don’t arrest me for synonym crimes, I figure the new word is not just novel-safe, but novel-worthy. NOTHING BUT GHOSTS is Young Adult (“YA”) fiction. How does that work, exactly? I mean, can anyone read it? Does one need to be accompanied by a young adult? Preferably one is accompanied by a young adult. I mean, is there any better company by which to be accompanied? I find that young adults are marvelously intelligent, often fearlessly so, and that they have a lot to teach. They make us adults better people. I take it there’s a shortage of such souls in your own neighborhood? I understand you’ll be teaching a writing course at a local junior college this fall. That’s correct. 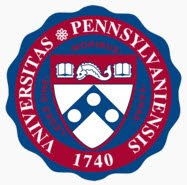 I’ll be teaching at my alma mater, University of Pennsylvania. Yes. I believe I’ve heard of that school. Known primarily for its football team. Oh, and for the borderland of delicious, two-day-old soft pretzels. 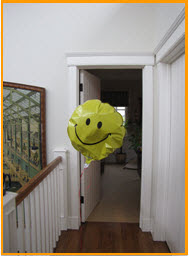 So, Ms. Kephart, you have an amazing blog. What do you like most about blogging? And how do you come up with all those recipes? 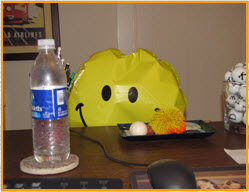 Oh, gosh, I’m so glad your intern stopped by my blog. How much are you paying that intern again? Because honest to goodness. There are no recipes. Tessa does recipes. Tessa does recipes with pictures. Tessa is gorgeous. 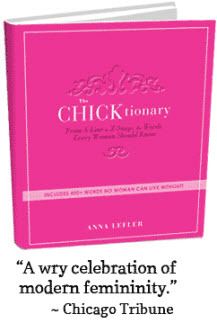 Is your intern a gal with a foodie predilection? I think your intern has been chilling with Tessa. [stony silence] Are you friggin’ kidding me? No recipes? At all? Then where did this three-layer dip come from? You know what? Don’t worry about it. Not your concern. I tell you what, though, when Tiffany the Intern gets back from getting my Gremlin detailed, she’s going to have some tall explaining to do. Anyway - back to you. I understand you are a National Book Award finalist. Can you tell us a little about that? It’s been too long ago. I forget. I do remember, though, chairing, a few years later, the Young People’s Literature jury. I didn’t just get to read a lot of great books, wear a pretty great dress, and chill with some cool people. I met Steve Martin. He said that you’d been stalking him? You want an NBA nomination? Well, you have to either start shooting hoops or write a pretty good book. Huh. Kind of sounds like a pantload of work. Something to think about. You are passionate about dance. (I myself find the The Hustle hypnotically irresistible.) Tell us, please, what is your favorite dance and why? Must you make me choose? All right. I’ll say it. I’ll confess, since, from what I can tell by your site meter count and the number of comments you generate, no one reads your blog anyway, I love the rumba. It sinks the music into your bones. Okay, it says in my notes that you are an accomplished photographer. I’m going to assume that’s wrong and take a wild guess that in your spare time you are…an ocarina enthusiast? Did you just make that word up? Ocarina? Can I have it? Oh, for cryin’ out loud. Okay, photography it is. Do you find there’s an overlap between your writing and your photography, or are they completely separate processes? You didn’t answer me, about ocarina. Okay. I won’t steal it from you. I will, however, say, that I couldn’t write without photographs. The camera forces me to look harder, look better, look smarter. And heaven knows, I need all the help I can get. Can you share with us some other works of yours that are currently available or on the horizon? I love horizons, don’t you? On mine is a YA novel, due out next March, called The Heart is Not a Size, which takes a group of privileged kids on a mission trip to Juarez, Mexico (a place I visited a few years ago). Next fall, an historical novel, Dangerous Neighbors, is due out—this book focuses on a single day in Centennial Philadelphia. Think what you must, but I was not alive during the Centennial. At the moment I am writing a novel for adults that is wild and weird and (might I say this?) wonderful. Then there are those other nine books. But I don’t think we should go there, do you? Lastly, I have one more question for you. I know it’s a cliché, but if you were stranded on a deserted island…what color vinyl jumpsuit would you hope to be wearing and why? Purple. Because it would match the eye shadow in my travel kit. Thank you so much for visiting with us today, Ms. Kephart. It was an honor having you here. Again, congratulations on the debut of your wonderful novel, NOTHING BUT GHOSTS. I wish you fantastic success! Miss Lefler (I can call you Miss, still, yes?). It’s been the highest privilege. And I mean that. Kind of. along with your mailing address. The senders of the first ten emails with links will receive books! A $150 Amazon.com gift card! Just email your link to me before midnight (PST), July 4, and you will be entered in the drawing for the gift card. I hope you'll join me (and many of Beth's wonderful bloggy friends) in helping power this independent, grassroots effort to promote an exquisite book. and good luck in the contest! Why aren't we building airplanes out of these things? 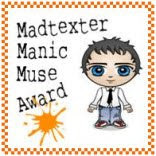 Thank you to Mad Texter for this tasty award! 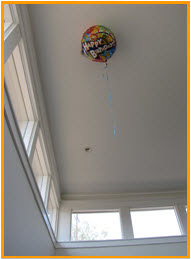 And thank you to Amy Jo at The Hopelessly Lame-Named Blog for this beauty! ...Whether It Likes It Or Not. We recently spent a long weekend visiting the in-laws in Northern(ish) California. Man, was it awesome. Our visit gave us the opportunity to get back to nature - to unclench from our jaded, smog-encrusted big-city lifestyle and really remind ourselves what's really real, you know? And Jon Bon Jovi waggled his head, letting an exhaust blast from a city bus ruffle his bangs off his face as he threw his broom and dustpan aside in a most haphazard manner. He liked the idea, I could tell. At great personal peril, I tried to take lots of photos as we waded up to our armpits in freakin' raw nature. This was our rustic nature pad - home base for gnarly au natural hi-jinks. but turns out that's just his personal statement. Nature Lesson #1: The forest is pretty casual. entire pack of birth-control pills. Ironic, yes? to Laughlin, Nevada for a girls' weekend. freakin' house or else it's going to lose it. and build...but I think you'll agree it was worth it. no matter how normal it looks. in the parking lot of Pea Soup Anderson's. Nature Lesson #5: Two words, dude - restraining order. Caught on film - the rare and dangerous Sneaker Snake! Note the coloring that says, "Danger!" Nature Lesson #6: You snooze, you lose. Yeah, right. Like that's real. fool you with fake crap. "When the zombie bunnies come out, it's time to go home." Nature Lesson #8: Zombie bunny! Run away! RUN AWAY! 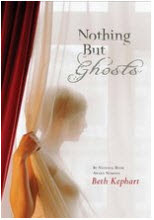 NOTHING BUT GHOSTS - Beth Kephart's new book that's already garnering stellar reviews - is now available for pre-order! To view the book's beautiful trailer, click here. 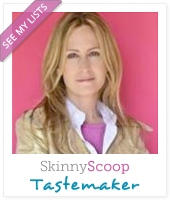 And thank you so much to Bebe Cannelle for the fantastic shout-out!